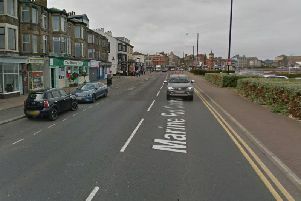 An army surplus store owner who has come under fire for displaying water-pistol toting dummies in camouflage gear outside his Morecambe shop has said he will not be taking them down. Morecambe and Lunesdale MP David Morris said he had received complaints from elderly residents in the town who are up in arms over the offensive nature of the display. And Colonel Bob Stewart, former United Nations commander in Bosnia, said he was “appalled” by it, and that the shop should “desist forthwith”. But Mark Shepherd, owner of the B-Army Surplus shop in Marine Road Central, remains defiant, and says many people support it. He said: “The mannequins held water pistols or wooden guns and had masks on. “The kids love it with the funny faces. “Then the council rang me and said someone had complained so I took the guns and masks off, and that was it until yesterday when I got the call off the Daily Mail. But concern has also been raised about the display and its location directly opposite Morecambe’s War Memorial statue. He said: “As a former small businessman trading for over 20 years I have never seen any advertising stunt of the likes of it. A spokesperson for the MP said Mr Morris had been referring the case to Lancaster City Council since July, following a steady stream of complaints from members of the public. Mr Shepherd, who moved in to the premises in June following three years at the Festival Market, said he would be leaving the display up. A spokesperson for Lancaster City Council, said: “As soon as this was brought to our attention we spoke to the shop proprietor and asked him to remove the offending items from the display, which he agreed to do. It is understood the “offending items” the city council are referring to are the guns and the masks.